Description Note on front: If a pix appears dark on the contact, but you still like it, go ahead and choose it. It can be lightened. Note by Claire Kellogg: Library staff, 1976 or 1977? Top left, Hazel Skelton, clerk. Lower left, Marge Minor, clerk. 2nd row top: Lois Sparks, clerk; bottom: Carol Hildebrand & Hazel Skelton. 3rd row, top: Sue Burgess, clerk; bottom: Lois Sparks. 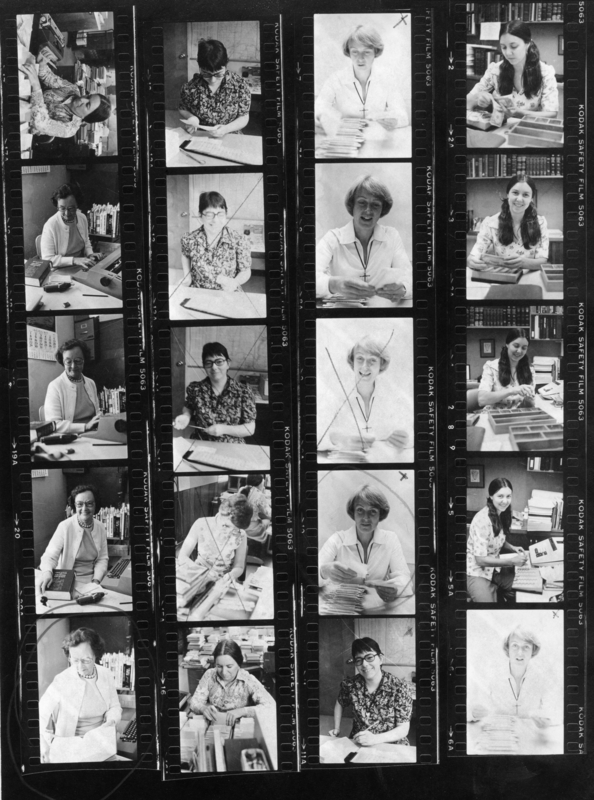 4th row, top: Claire Kellogg, reference librarian; bottom: Sue Burgess, clerk. Includes negatives.